Don't let your favorite resort get passed over and miss out on winning a Visitors' Choice Award. Each year we present the most comprehensive user-generated ski resort awards in the industry—The Visitors' Choice Awards. 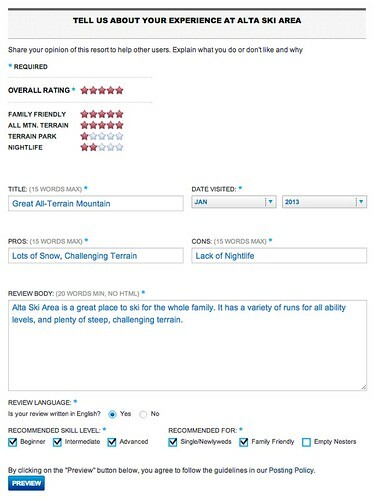 In order to choose the winners of each category (Overall, Terrain, Park & Pipe, Family, Nightlife) we turn to your reviews for the resorts listed at OnTheSnow.com. Since The Visitors' Choice Awards are a user-generated award, we look to get as much user engagement as possible. So, check out these step-by-step instructions on how to review a resort, so that you can contribute to the 2013 Visitors' Choice Awards. 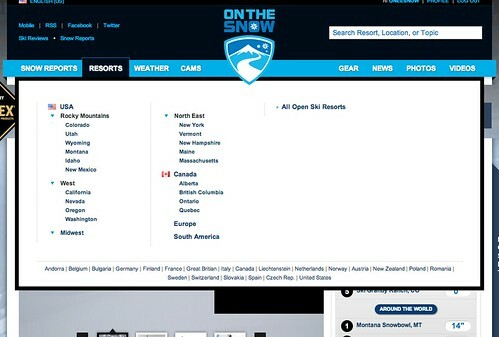 Just a reminder, in order to review a resort and have your voice included in the 2013 Visitors' Choice Awards, you must be a registered user of OnTheSnow.com. If you haven't registered yet, click here. 1. From the home page (http://www.onthesnow.com) click on the Resorts tab. 2. 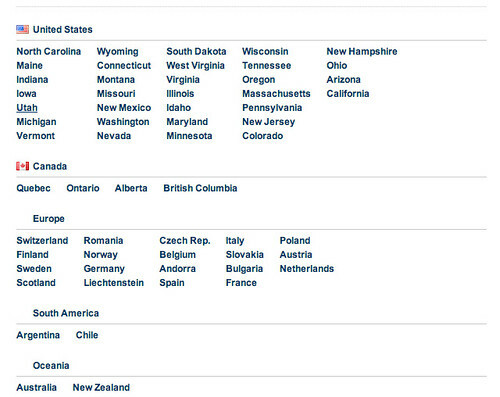 At the Resorts page, choose the state where the resort you are looking to review is located. For the sake of this example, we'll choose Utah. 3. At the State (Region) page, click on the individual resort you would like to review. 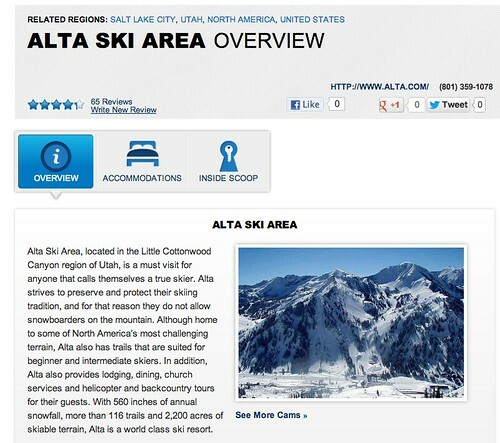 In this case, we chose Alta Ski Area. 4. 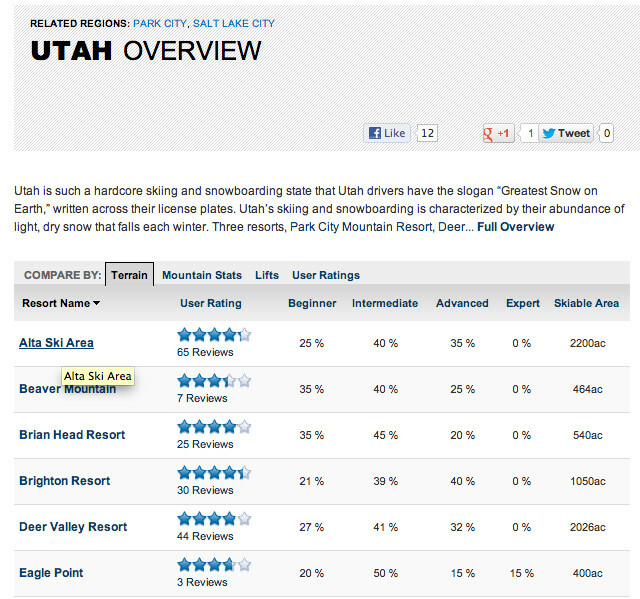 At the Resort Page, click on the small link below the Ski Area name, titled "Write New Review." 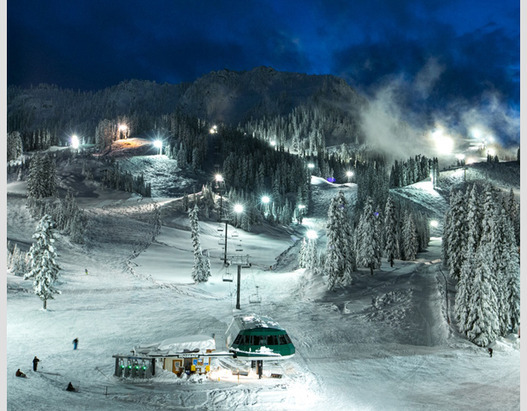 5. Review the resort based on the categories of Overall, All-Mtn Terrain, Terrain Park, Family Friendliness and Nightlife, on a scale of 1 to 5 stars. From there, enter a title for your review and the date in which you visited the resort. Then you can begin to describe the pros and cons (15 words max. for both) of the resort. Finally, write a short review of your experience at the resort (20 word minimum). When finished, click on the preview button. 6. At the preview page, make sure that your review is exactly as you would like it. You can also add a photo if you'd like, using the EDIT button. 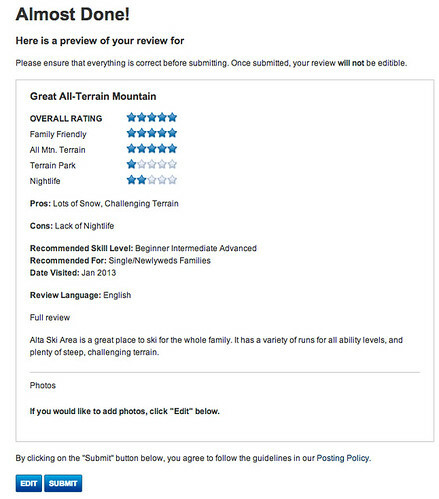 If your review is to your liking, click the submit button. Congratulations! You've successfully reviewed a resort and contributed to the 2013 Visitors' Choice Awards.